Grovehill Ballpark has been the home of Herts Baseball since 1996. It is one of the best baseball venues in the country with two purpose-built diamonds which have hosted the National Baseball Championships. Jct 8 Breakspear Way. At the second roundabout take the third exit – Maylands Ave. First exit at the next and then the third exit toward Redbourn. At the next, take the second exit – Agnells Lane, and left at the second mini roundabout – Washington Ave. Grovehill Playing Fields are after the houses on the right hand side. Jct 9 A5183 toward Redbourn. Follow this to the B487. Under the M1 and at the second roundabout turn right – Agnells Lane. Left at the second mini roundabout onto Washington Ave. Grovehill Playing Fields are after the houses on the right hand side. A414 toward Hemel, and onto the A4146. Right onto the A4147 and at the second roundabout take the first exit. Turn right at the mini roundabout at the end and the Diamond is first left. 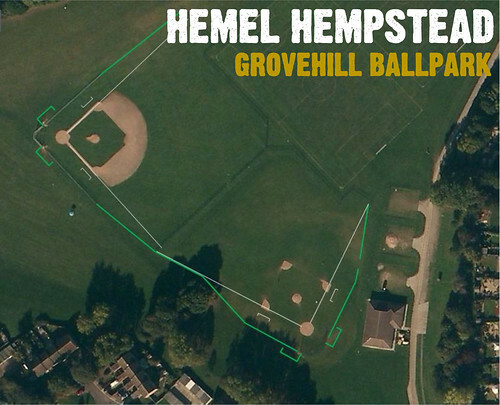 Hemel Hempstead is the nearest train station to Grovehill Ballpark. From the station, the easiest transport method is by taxi, or alternatively there is a bus service (routes 2 and 3 both go to Grovehill). A large number of car park spaces are available at the venue, all of which are free of charge.